Good morning, my darlings! 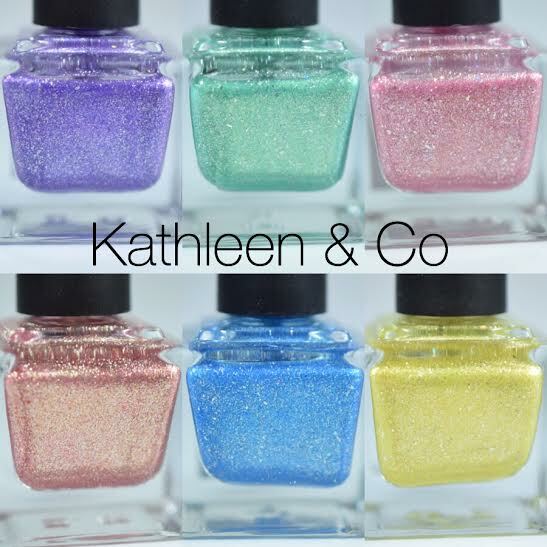 It's time for our featured indie series--this week stars Mia of Kathleen & Co.! I have seen swatches of some of Mia's beautiful new polishes around Instagram and I'm really excited to be featuring her this week! She's graciously decided to give away two sets of her ENTIRE 6-piece Spring 2016 collection plus a mystery nail art goodie to two lucky winners! Enter through the Rafflecopter below for your chance to win the gorgeous collection pictured below! Plus, if you follow us on Instagram (HERE and HERE) you have ANOTHER chance to win! THREE winners total! Good luck, my darlings! I love the green electroland and electric bugaloo. I really love Green Electroland and Lemon Drop. Thanks for the chance! I like Green Electroland !! Usually, I will choose purple over everything but, I am very interested on Rose-Gold Digger. Thanks for this opportunity! Beautiful colors! I love all of the colors, but I would have to say rose gold digger is beautiful!